» Kobe, Westbrook, or Rose: Who Does the Best Smoking-Guns Move? Kobe, Westbrook, or Rose: Who Does the Best Smoking-Guns Move? You have three choices: (1) Kobe Bryant doing the “pew pew” thing after a 3 and laughing just a litttttttle too crazily, (2) Russell Westbrook FORECLOSING on Staples Center and going “BOOM” just for good measure, (3) Derrick Rose going full Doc Holliday but also probably thinking to himself, Ow, my groin just exploded. You can only choose one. If you choose someone other than Westbrook don’t ever speak to me again. Respect due to the NBA GIF mastery of @Jose3030. 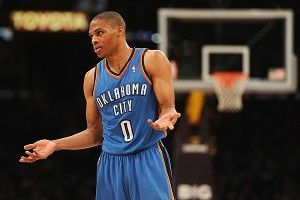 Russy, Kobe, and Rose might make the plays, but he makes them live for ever in a loop. Vote now on Grantland’s Facebook page! Pick Your Favorite NHL Playoffs Ad!